The pilots and gunners from 566 th Attack Aviation Regiment on background of the Il-2. Among the pilots – one Hero and one twice Hero of Soviet Union. 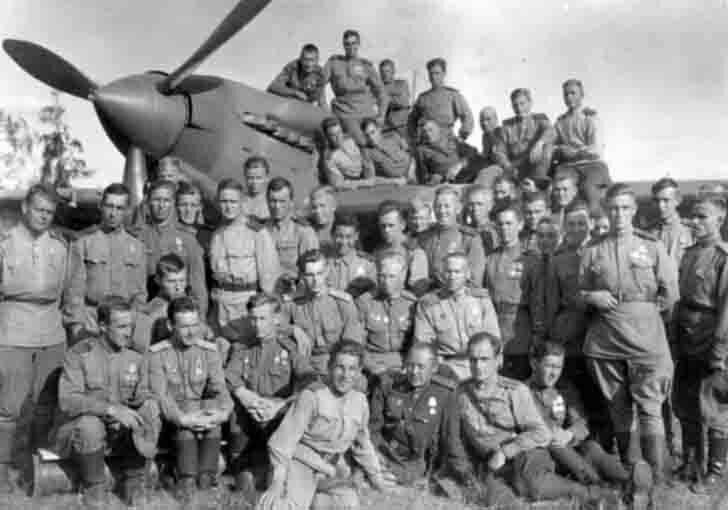 566 (Solnechnogorsk) Attack Aviation Regiment was part of the 277th Attack Air Division of the 1st Air Army of the 3rd Belorussian Front. At the bottom in the center, in a dark uniform – Golomazov Mikhail Ivanovich. Above him, a little to the left, with blond hair – Korchagin Lev Pavlovich Hero of the Soviet Union. To the left of Korchagin – Myhlik Vasily Ilyich, twice Hero of the Soviet Union. Source: Family archive A. Golomazov.